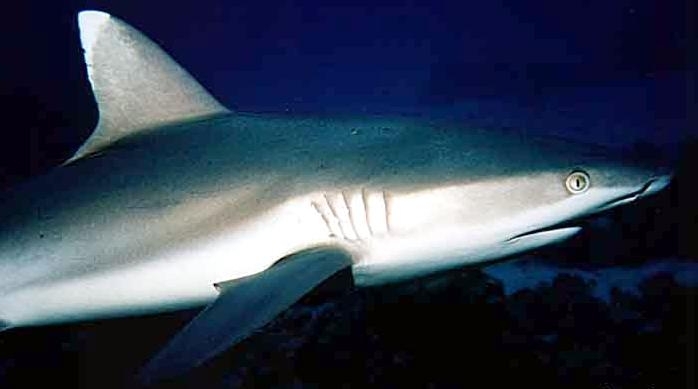 Gray Reef Sharks are dark gray or bronze-gray above (dorsal side) and white below (ventral side); their caudal (tail) fins have a conspicuous wide black posterior (rear) margin; the undersides of their pectoral & pelvic fins have black tips and posterior margins, but their fins otherwise are not conspicuously black or white-tipped except for a pale-tipped first dorsal in some individuals in the Indian Ocean. 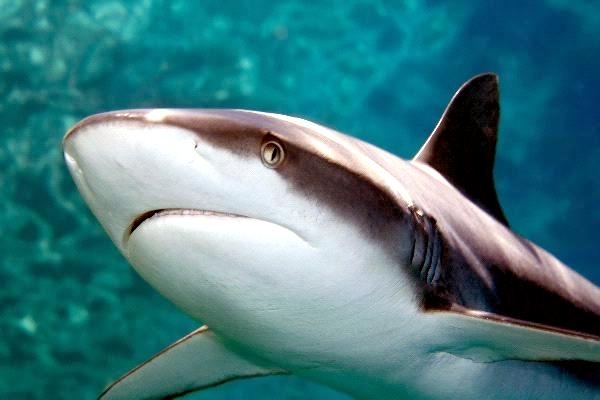 They are a medium-sized to large shark with broadly rounded snouts. 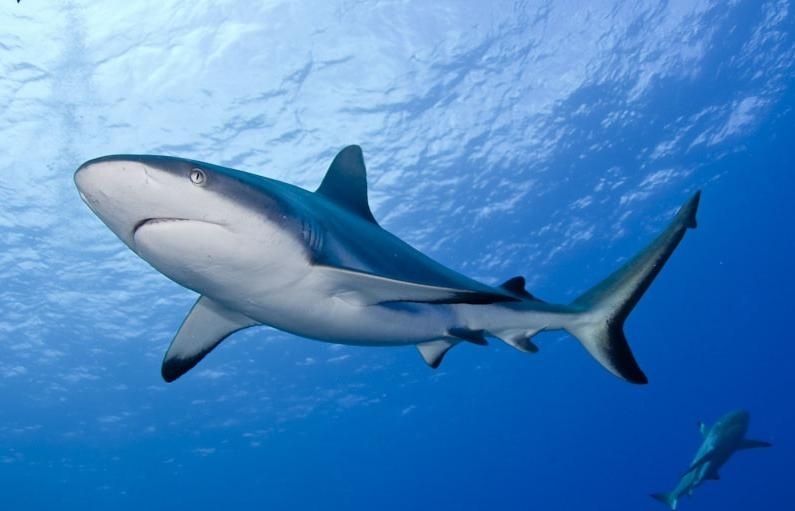 The origin of their first dorsal fin is usually over or just in front of the rear tips of their pectoral fins. 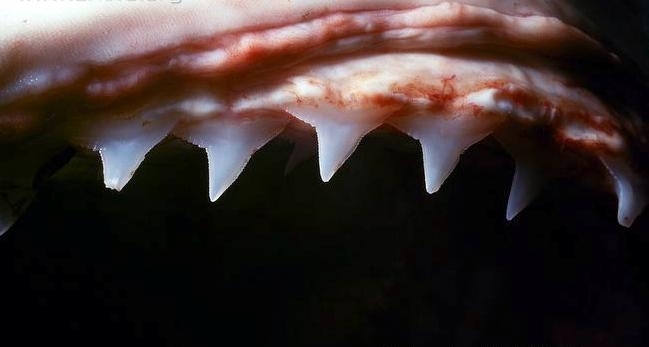 They have no inter-dorsal ridges. 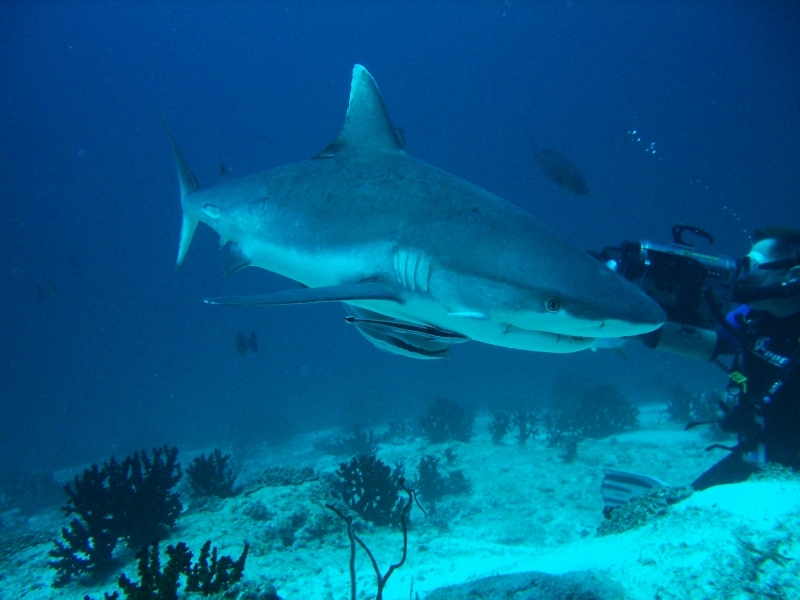 Maximum size is reported to reach up to 2.55 meters; however the largest measured on record was 1.72 meters (female). 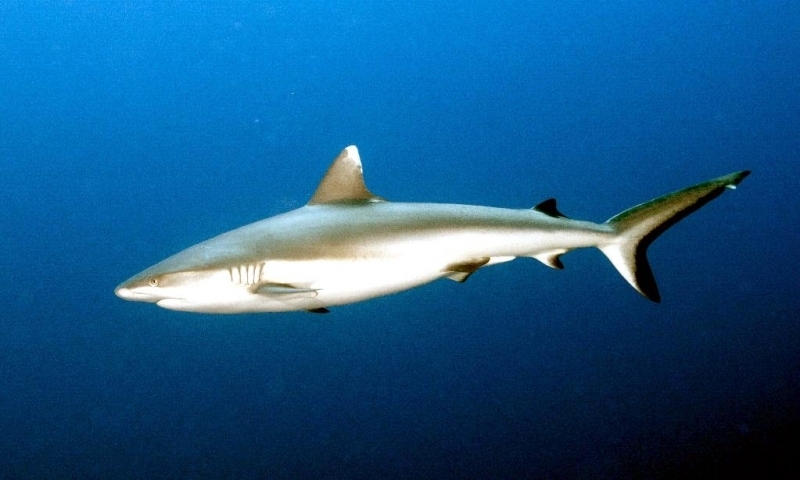 Most are 1.5 meters in length. 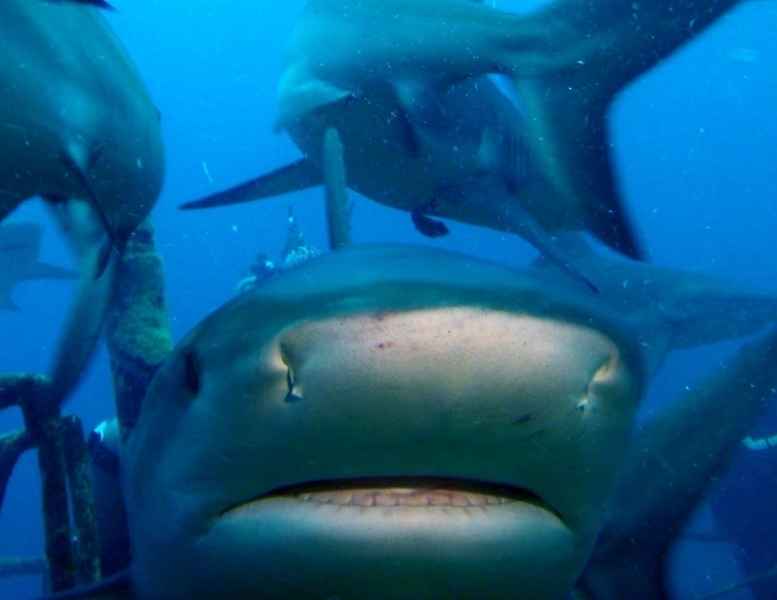 Their maximum weight is 34 kilograms and their maximum reported age is 25 years. 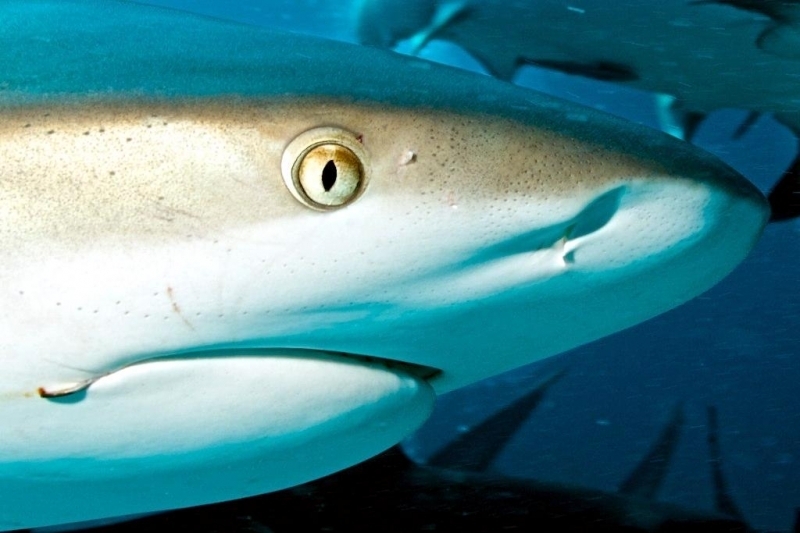 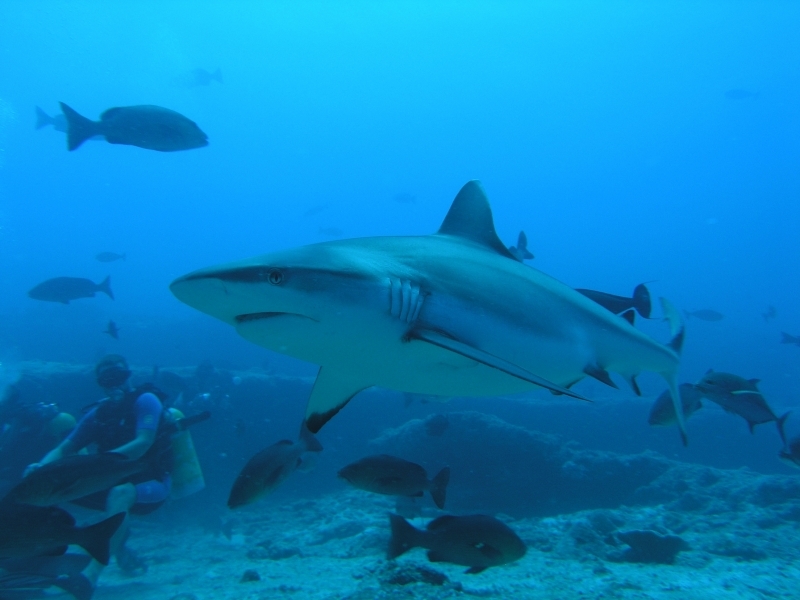 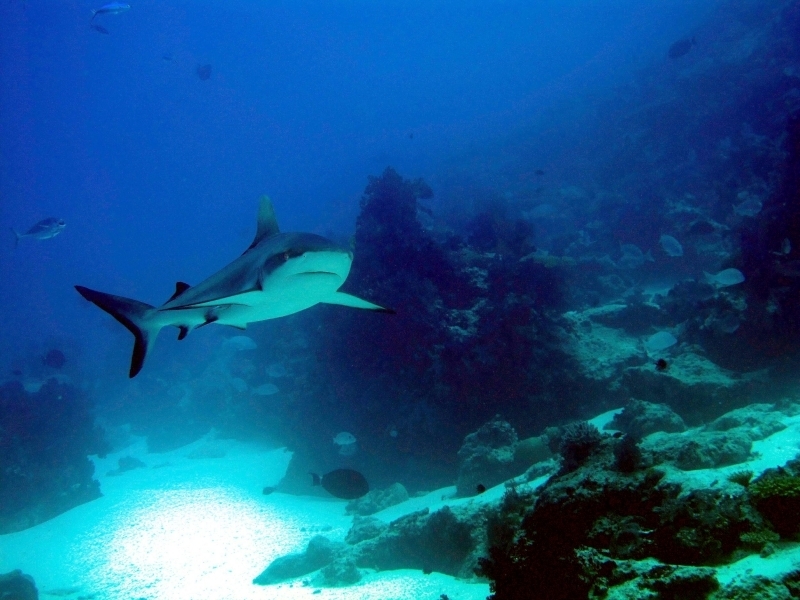 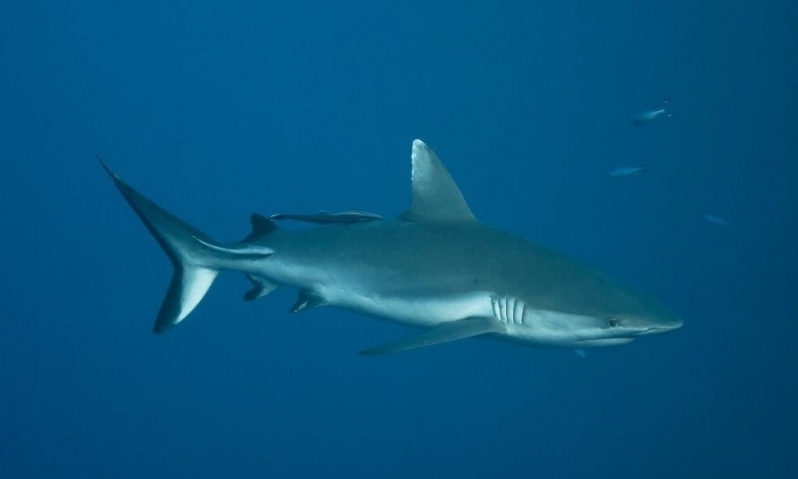 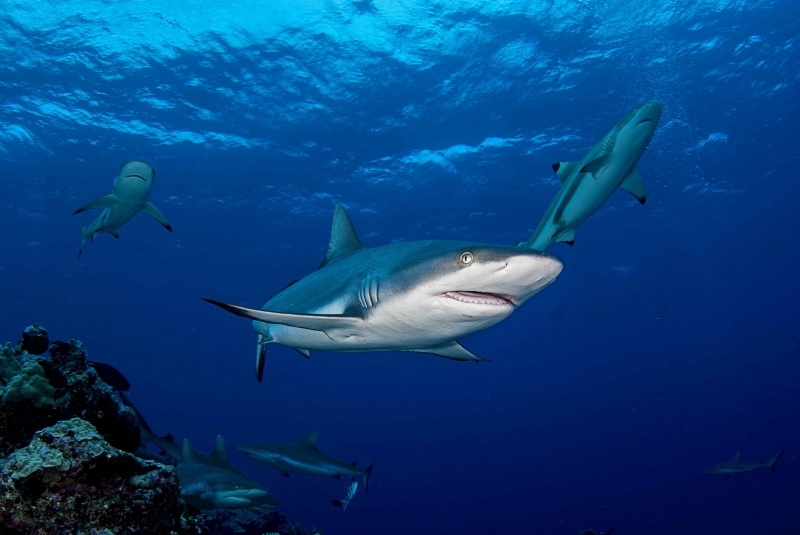 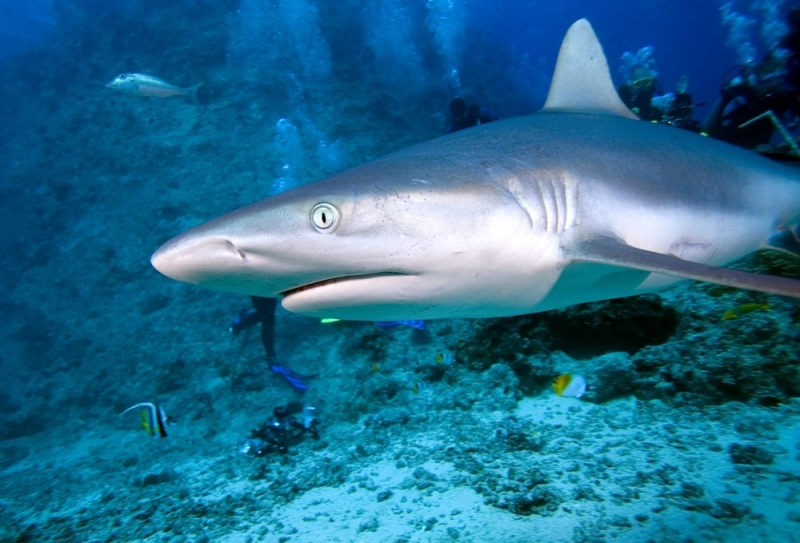 Gray Reef Sharks are a curious & aggressive species repeatedly indicated in human attacks. 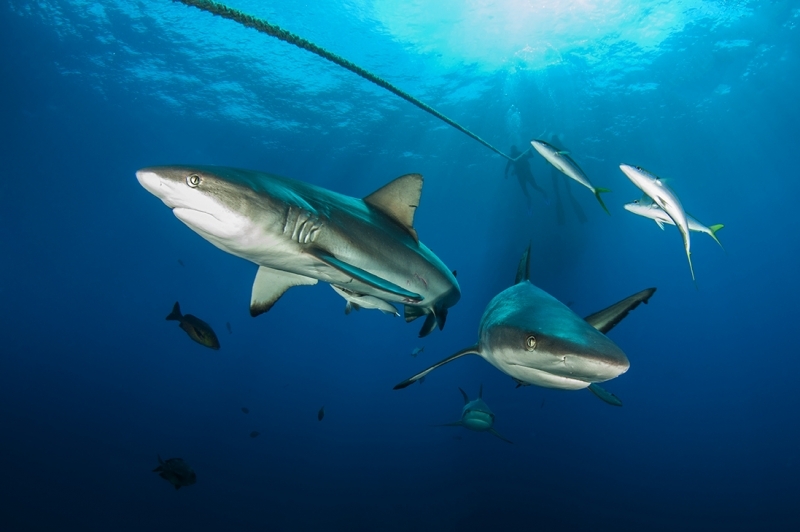 They should not be touched, cornered or approached by divers. 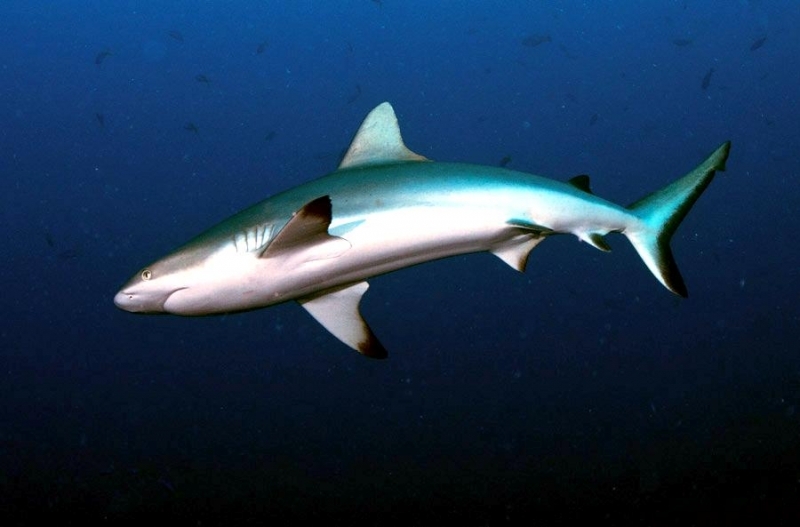 They performs a dramatic threat display featuring a raised snout, stiffly lowered pectoral fins, an arched back and exaggerated swimming movements. 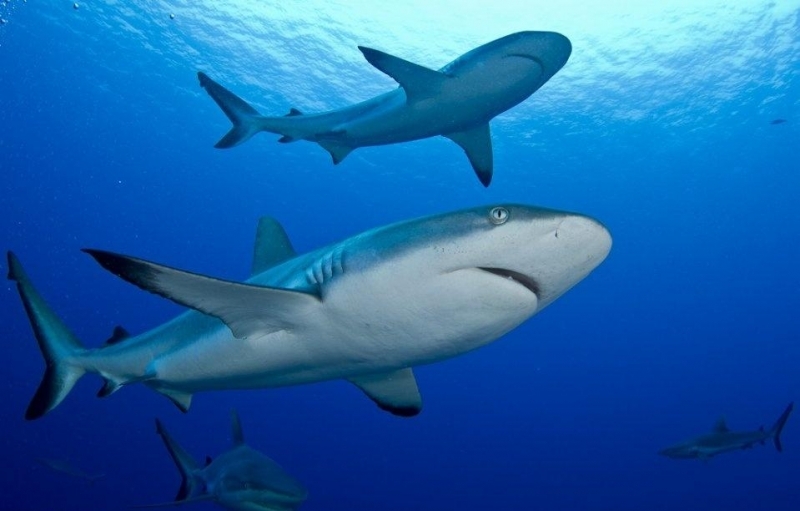 Gray Reef Sharks occur on continental & insular (island) shelves and the oceanic waters adjacent to them. 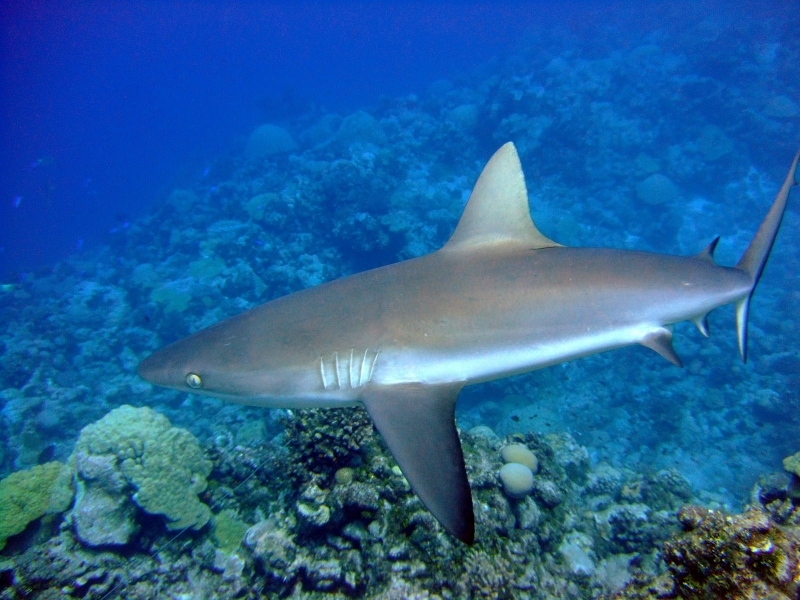 They are common on coral reefs, often in deeper areas near drop-offs, in atoll passes and in shallow lagoons adjacent to areas of strong currents. 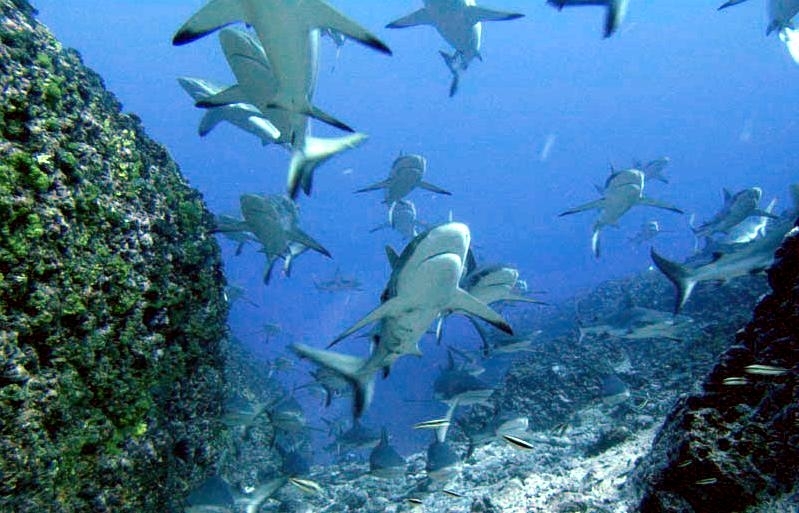 They form schools during daylight hours in aggregations of up to 100 individuals. 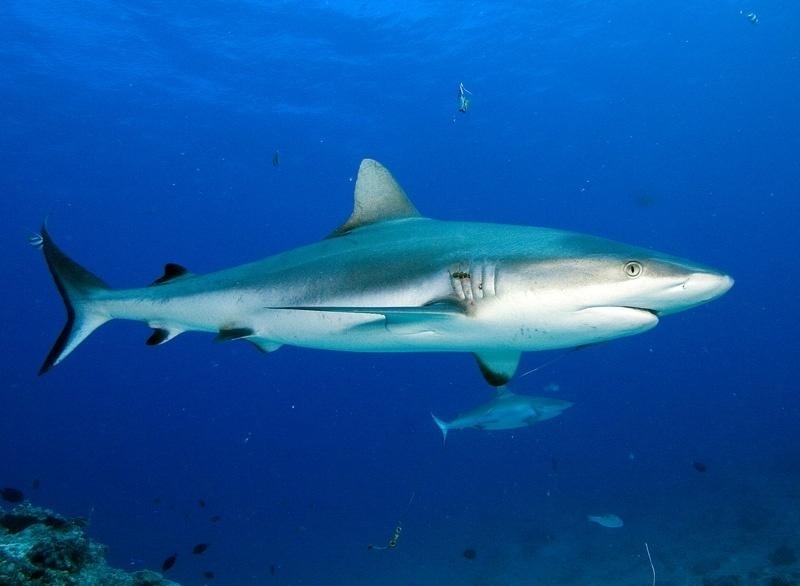 Although they are active during the day, they are more active at night when individuals spread out over large areas of the reef often entering shallow lagoons. 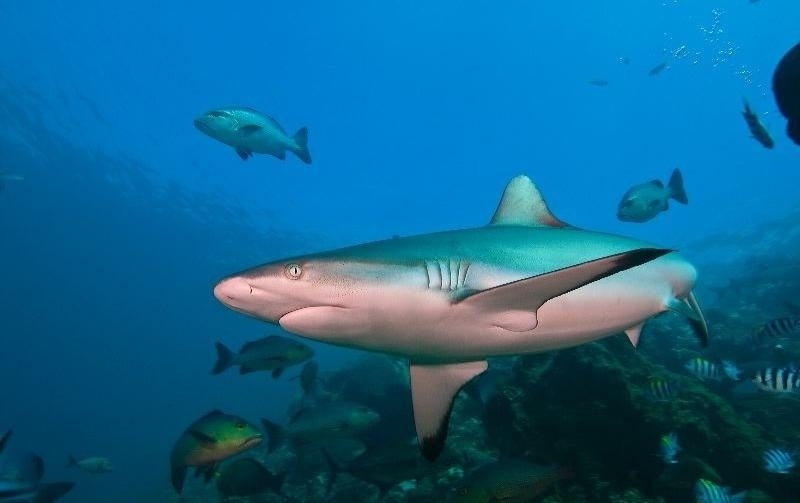 They spend their time during the day cruising along the shallow fore-reef and in reef channels, especially in areas with strong current; individuals often move into reef passes with ebb tides. 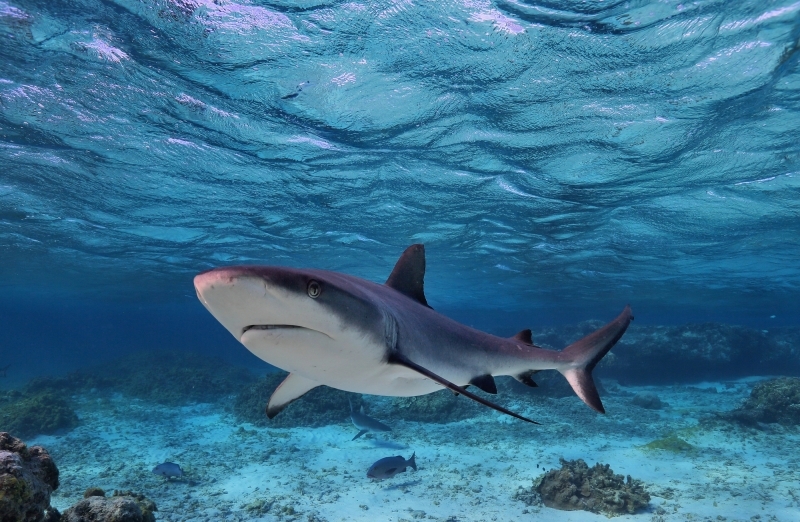 The average home range is 4.2 kilometers. 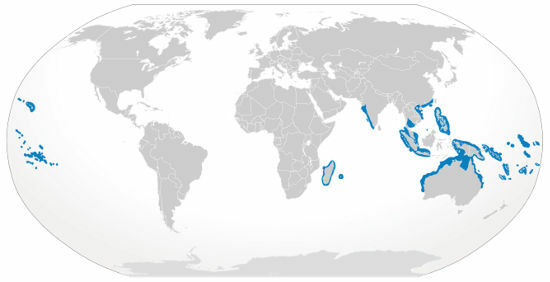 They are found throughout the Indo-Pacific: Madagascar and the Mauritius-Seychelles area, possibly India; also in the Red Sea to South Africa. 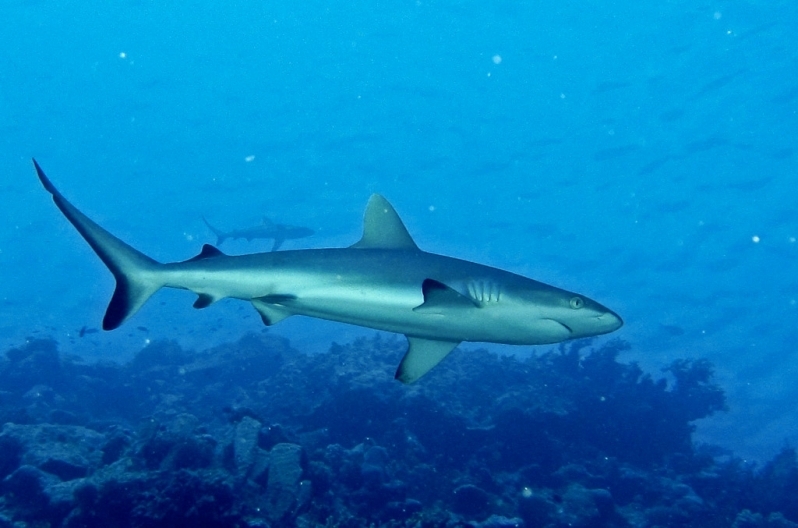 In the Pacific, the Gray Reef Shark ranges from southern China to northern Australia and the Tuamotu Archipelago to Hawaii. 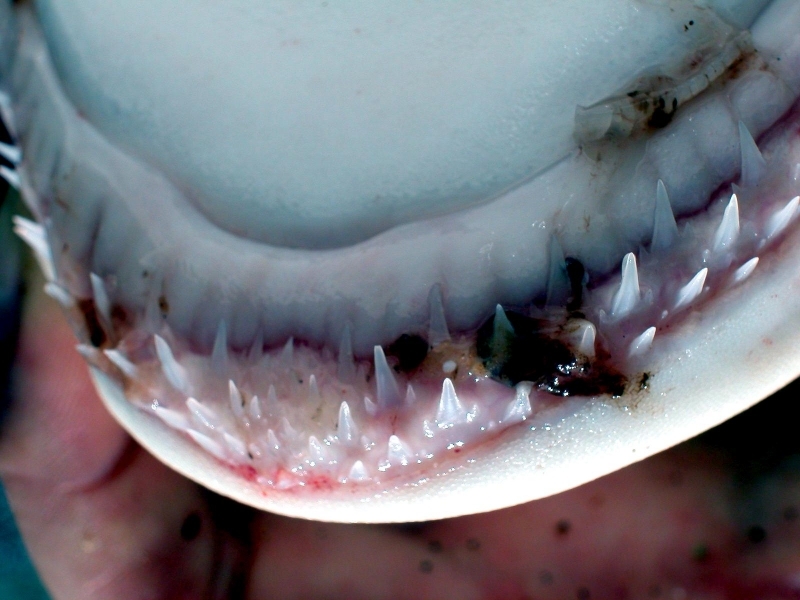 They are found in depths between 2-800 meters. 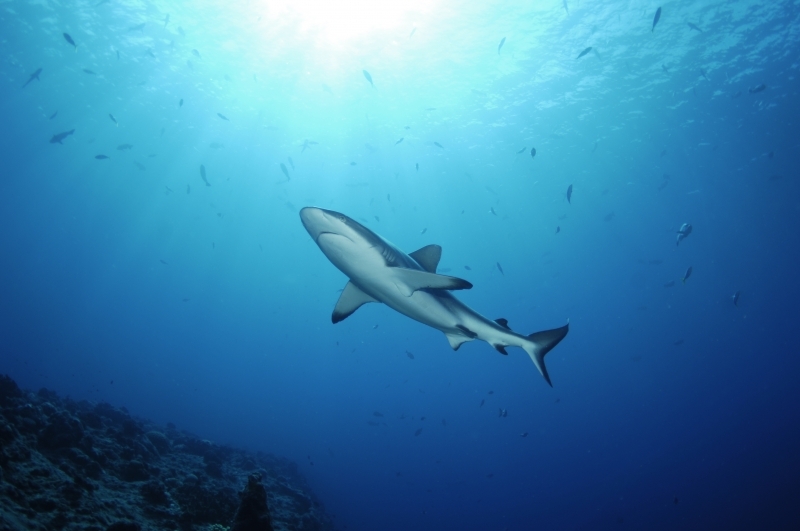 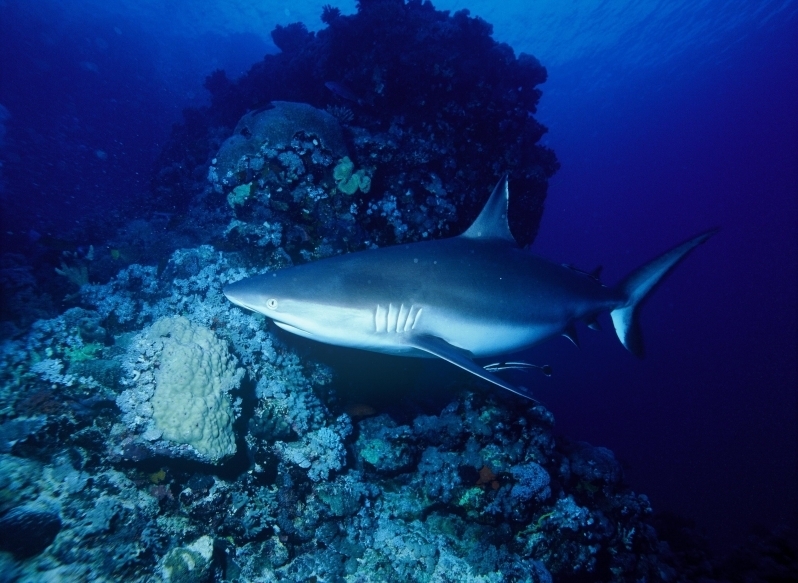 A Gray Reef Shark was photographed at 800 meters by a submersible off Maui in the Hawaii Islands. 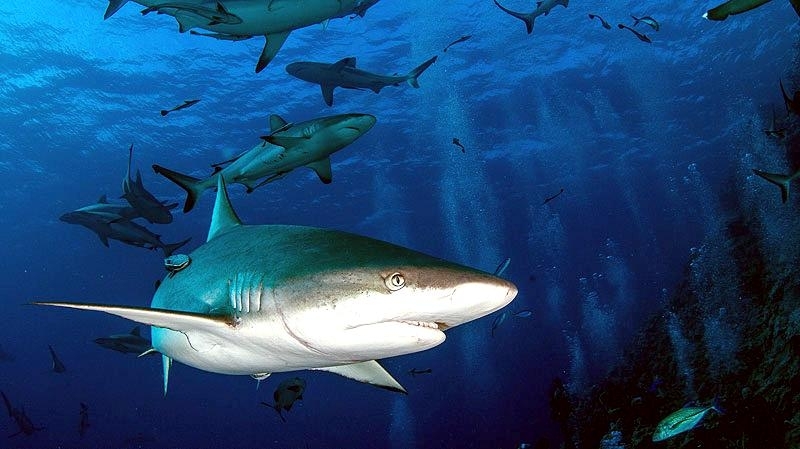 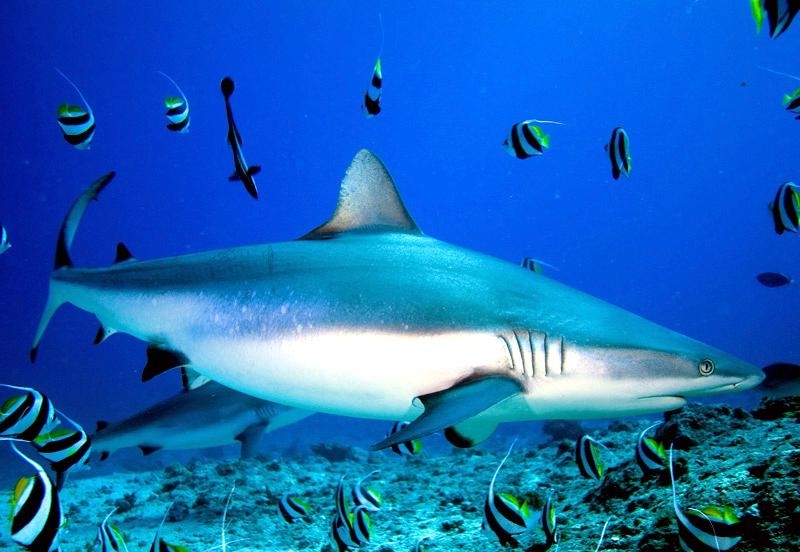 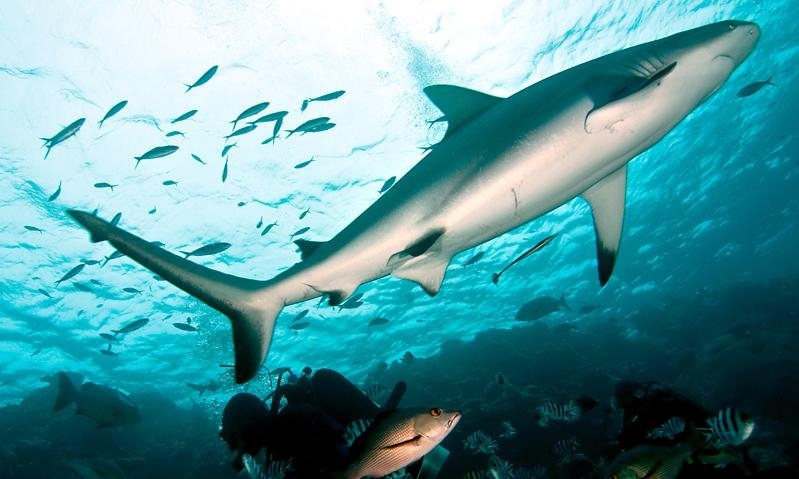 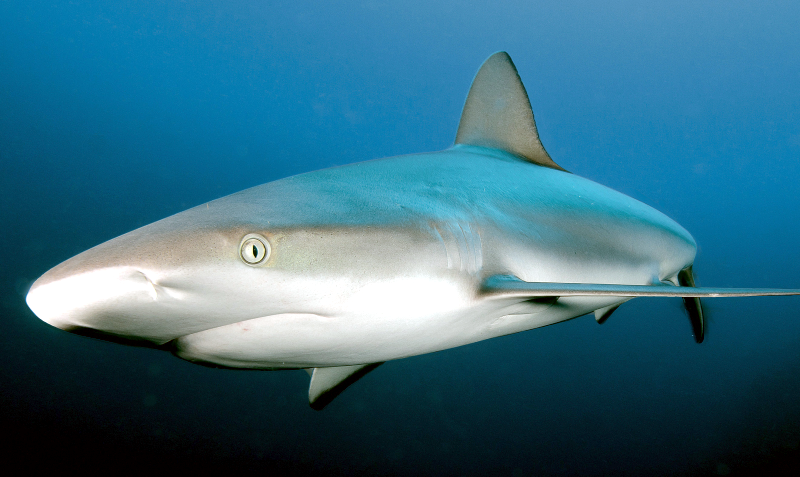 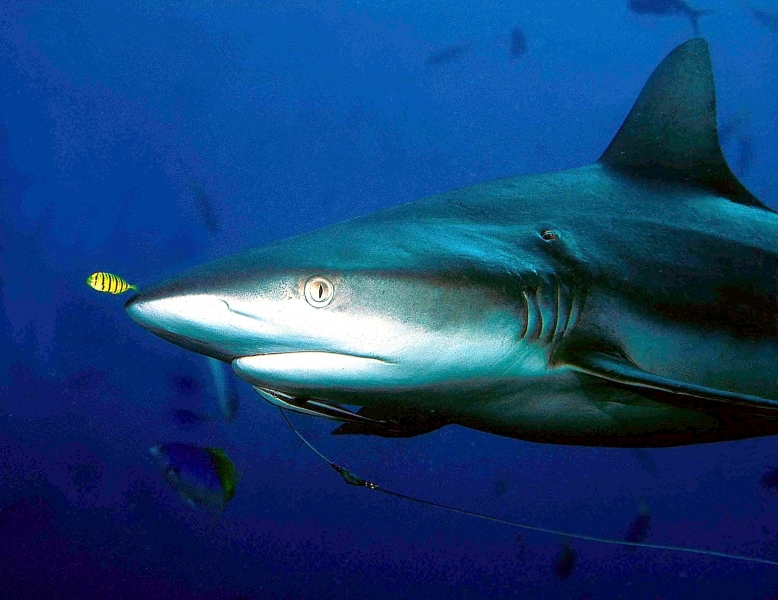 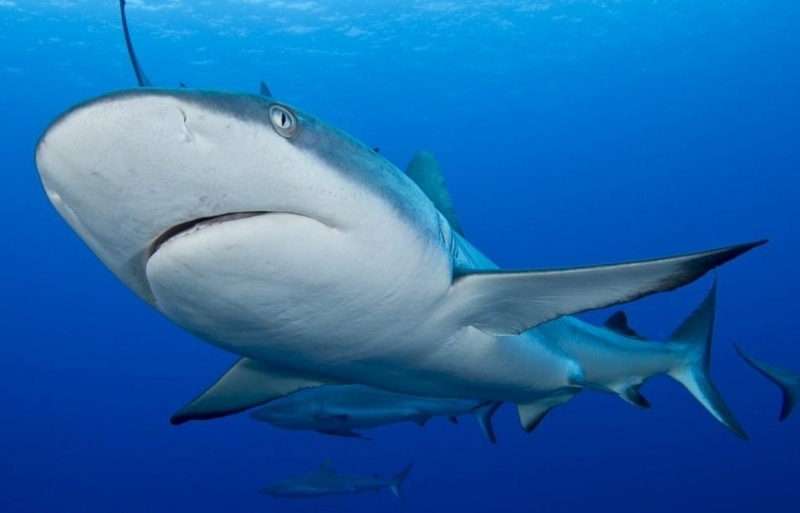 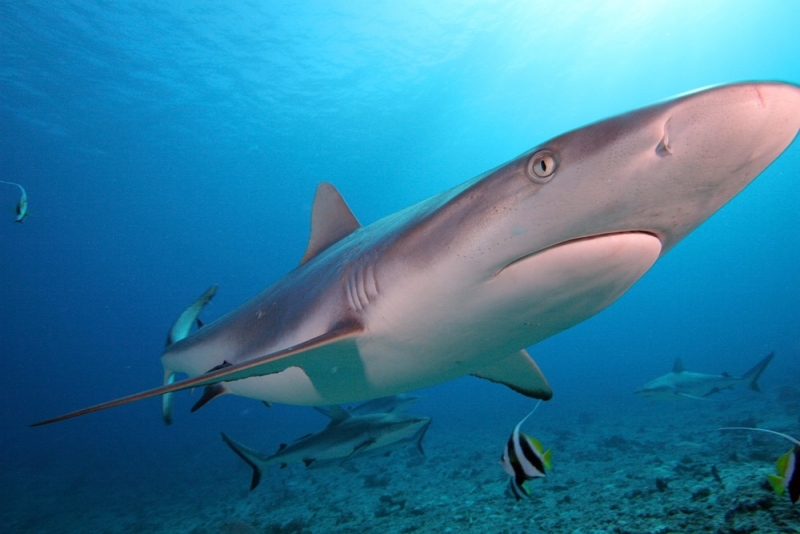 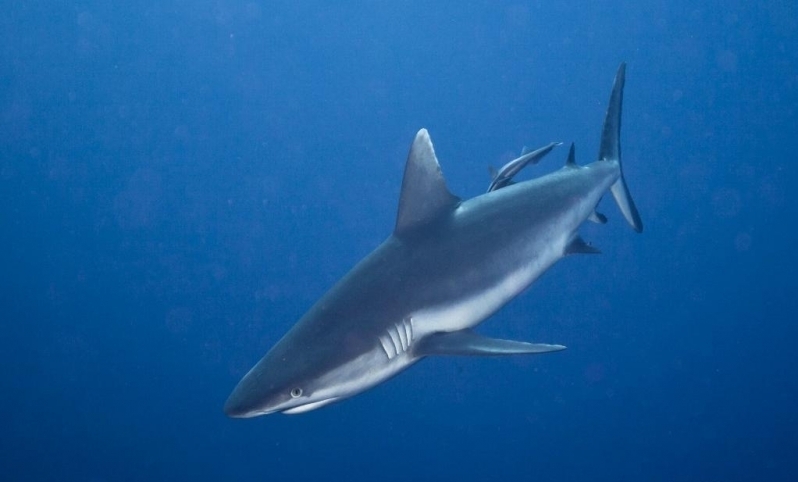 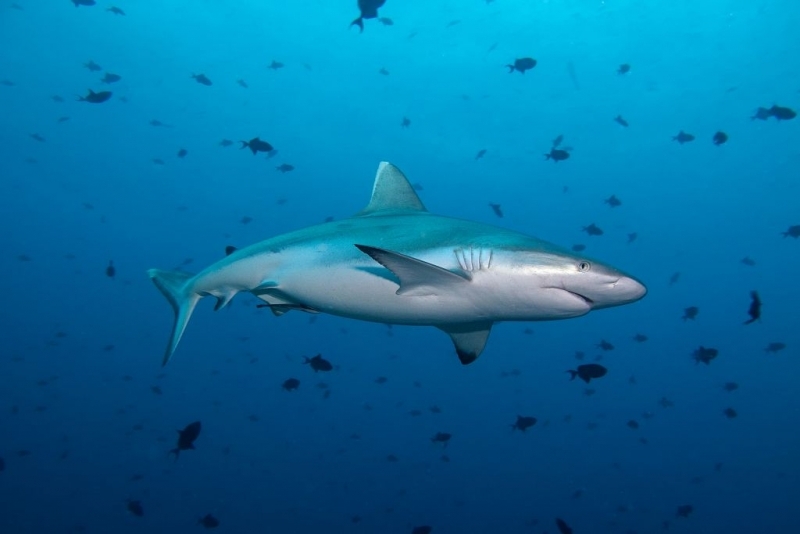 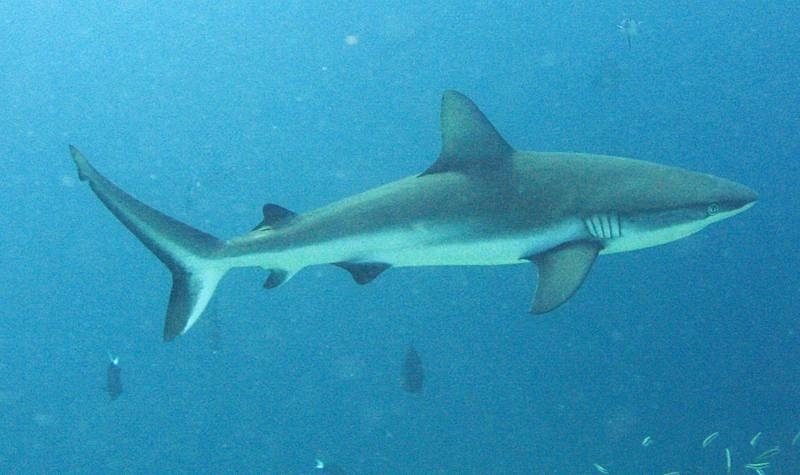 Gray Reef Sharks feed on reef fishes, squids, cephalopods, crabs, lobsters & shrimps. 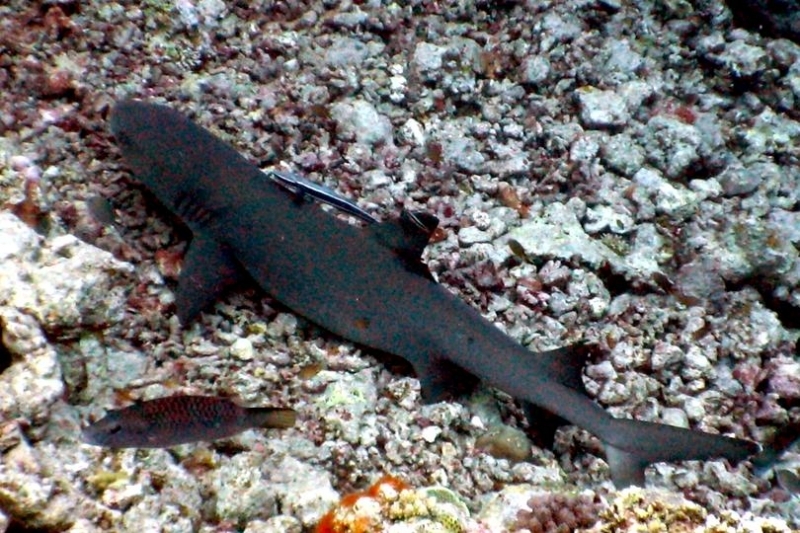 They have been observed herding fishes against the reef face before attacking. 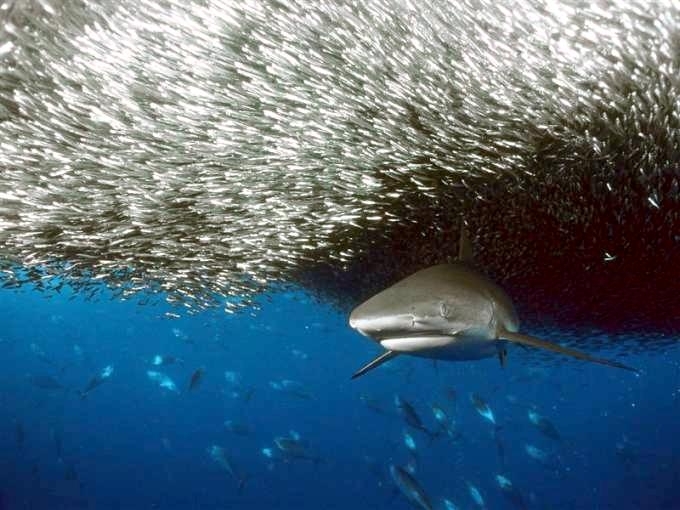 They tend to be aggressive under baited conditions and readily enter into an excited mob feeding pattern (true feeding frenzies are extremely rare) at which time they may become quite dangerous to humans. 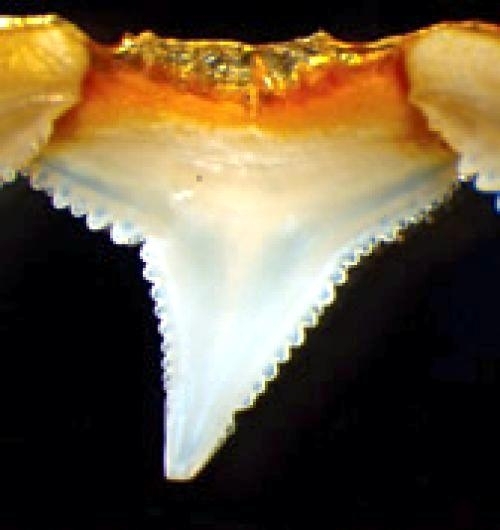 This species is viviparous with a yolk-sac placenta; they give birth to 1-6 pups in a litter following a gestation period of about 12 months. 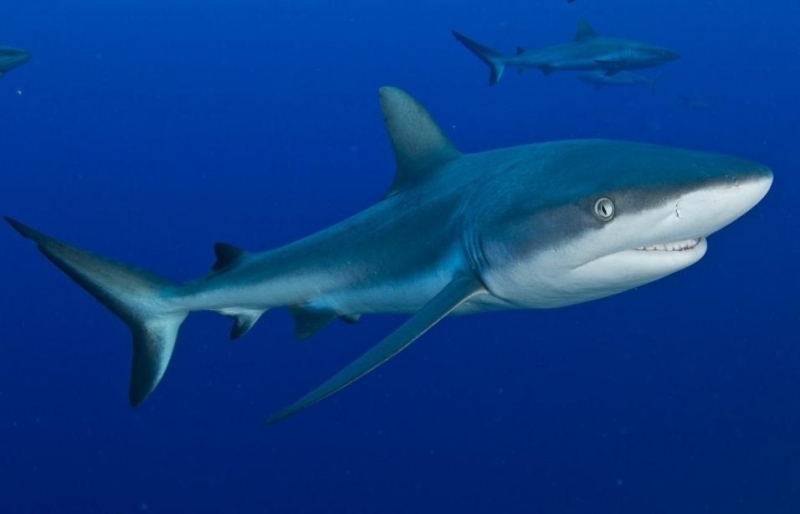 Birth size is between 45-60 centimeters. 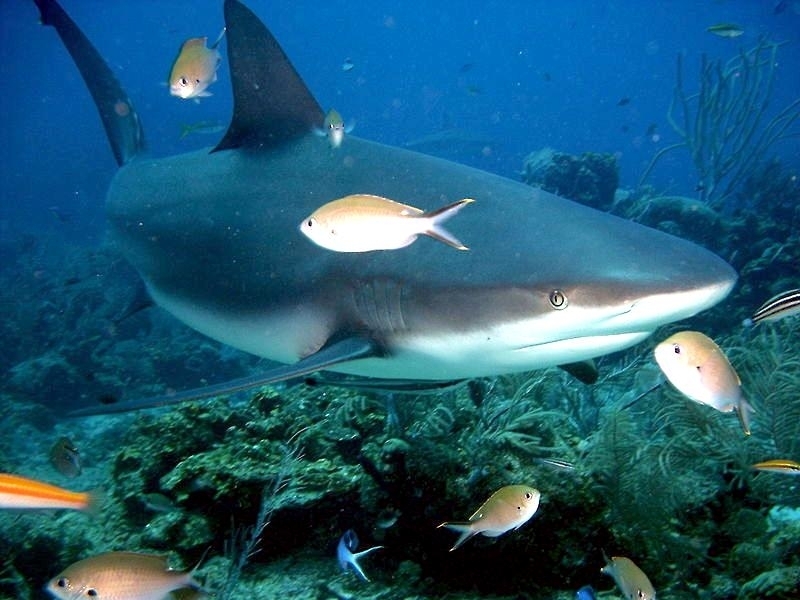 Males and females mature at about 7 to 7.5 years, males mature at 1.3-1.45 meters, females mature at about 1.2-1.35 meters. 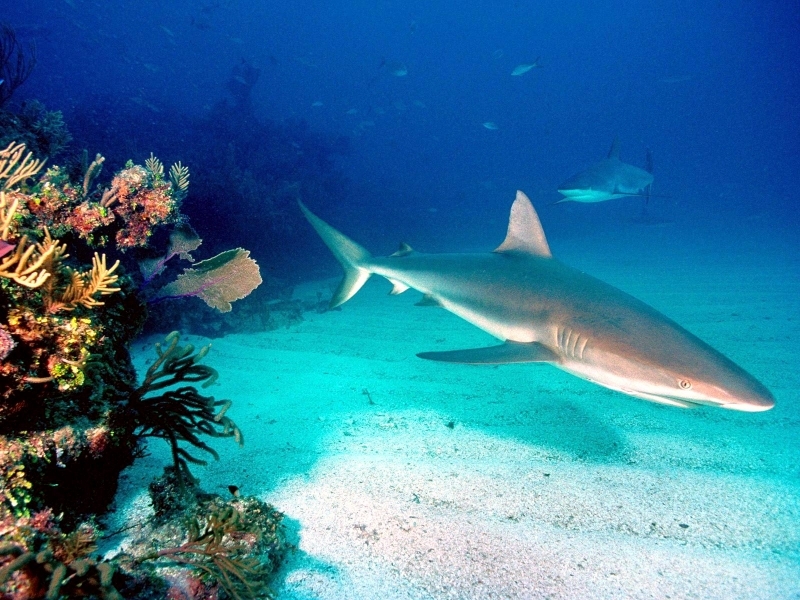 The expected life span is at least 25 years.